The reach cast can be the difference between catching fish and not. 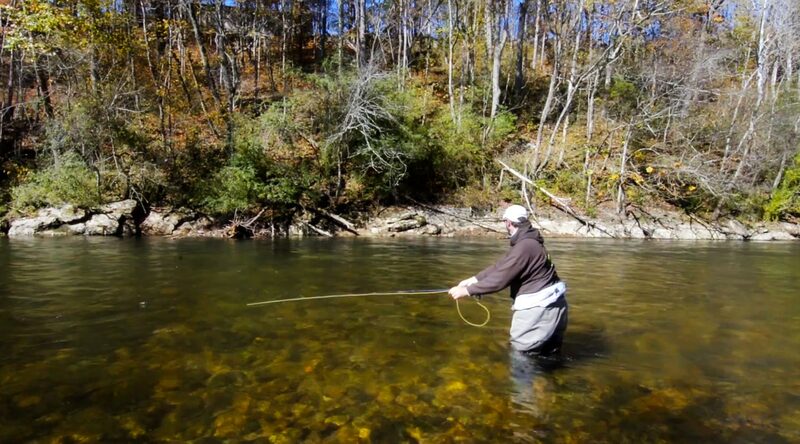 All too often you find yourself casting across fast water to a rising trout on the far bank. It’s a classic set up and one that can make you crazy. You land your fly in the exact spot, only to have it dragged away as the faster current midstream pulls a belly in your line. Your best shot at hooking a fish in this scenario is to make a reach cast. The reach cast builds a mend into your line before it touches the water. It can buy you a perfect drift long enough to fool a sipping trout. Make your normal cast and after you stop your rod tip to form the loop, move the rod tip upstream as the loop unrolls. The movement is perpendicular to the angle of the cast so the tension stays in the line and keeps it energized and on course. Once you know how to make this cast, you’ll wonder how you ever fished without it. This entry was posted in Fly Fishing Tips & Technique, The Hot Ticket, Trout Fishing and tagged fishing, fly casting, Fly Fishing, fly fishing kung fu, fly fishing lessons, Fly Fishing Photography, Gink and Gasoline, hook set, how to fly fish, Kent Klewein, learn to fly fish, Louis Cahill, mending fly line, photography, reach cast by Louis Cahill. Bookmark the permalink.